The Future Generation canvas has been completed. The varnish has been done and I just need to add the wire and label the back. It is 18"x36"x1.5", acrylic on exhibition canvas. I received permission from both icon commissions to complete one of the two totem series paintings, as I really needed to present one to the gallery ASAP. (The other large canvas of the 'Brown Bear' will be completed as soon as possible.) Gallery sales never happen right away, and the artist always sees the sea of red in the home budget coming around every corner. The 'Future Generations' section is from the "Seventh Generation Pole / Honour of the Children Pole" at the Capilano Suspension Bridge Park. It was designed by James Lewis and carved by Wayne Carlick in 1995 and "raised in 1997, to honour all the artists and carvers in the past, the ones who continue today and those who will pass on their culture in the future". 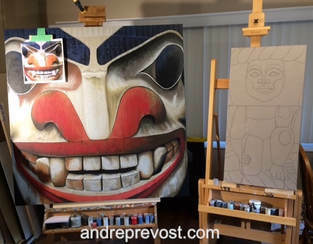 A few months have gone by since my last Journal entry for the totem paintings at the end of October. A few things were at play. Being the artist, the quest of survival on the home front is always a going concern. The totem series is especially so in that, even though some question where the artist is in my work (seemingly devoid of interpretation and personal messaging), it remains a passion and a love. There are so many totems that I hope to experience in person, and photograph from my perspective; angle and lighting being especially important. There are so many that I would dearly love to capture close-up facets, within the time capsules of their lives. But the hurdle at this time is getting past all the questioning and re-rediscovering my original passion with the series. It wasn't about a commercial interest, but it gets challenged when struggling to make ends meet. The pressure to produce naturally railroads the process and as an artist, I always need to find my way back to allowing myself to respond to the totems and give them the time they require. I do have those two canvas which are near completion, but another icon project came up in early November. It turned out that the project came from two different sources but for the same prototype. Each icon would be of Rose Prince, better known as Rose Of The Carrier. It is now January 18th and I'm in the process of painting after a month and a half of research, and numerous design directions. Once I get these two icons completed, I will have to get right back to the two totems ASAP as the pressures of the home budget always remain. It has been slower going in recent weeks. There are those dips in the road where an artist feels the weight of the work and the pressure of trying to support ones family and its medical needs. But even if the progress hasn't been as well as I would like, it is important to trudge along in any case, and work through it. I was tackling the detailing of the Brown Bear Totem painting, but I was overtaken by the need to begin another totem section. This has been an essential part of this journey with the totems, allowing them to draw me, each in their own time. In light of the dialogs around appropriation concerns, with concerns of First Nations designs being used or re-interpreted by non-Indigenous artists or companies as an example, mine is not to create new artworks in the conventional sense. Mine is not to interpret. I suppose that this self-discipline comes from my years in Byzantine Iconography, where to, I have always trusted the Masters and respected the forms, traditions, symbolism, colours, etc. In doing so, my works avoided error and inadvertently posing questions or scandal. The same can be said for this series, this journey with the totems. I allow myself to respond and to use my skills to capture what I see, and all the details within. It is imperative that I keep adjusting the forms and lines as required, until they are as exact as need be (aware of how precise these forms are from Nation to Nation, imparted with their meaning and movements). I trust the image of the totem and the Master's creation. My task is to capture a facet of a particular moment in time within a totem's life span, preserving the Master's vision and skill. And unlike a photograph, the canvas painting brings a viewer, while remaining true to the original totem, an experience of vibrancy from the totem; the same which I feel when I come in contact with it in real life. So, being free from trying to come up with an artistic concept for a painting, I can follow the images of various totems as they beckon. And they do. This new canvas is a case in point. I had been considering a few options, keeping in mind the canvas sizes that I had on hand. 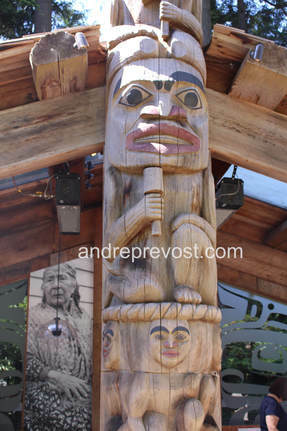 One of my JPEGs was from the second lower layer of the House Pole at the Capilano Totem Visitors Center, "Seventh Generation Pole / Honour of the Children Pole". It seems simple enough but the forms and textures within and subtle colourings are actually complex in their simplicity. Carved by Wayne Carlick, 1995. The drumsticks and tools that they’re holding are those that they will pass on to the future generations. 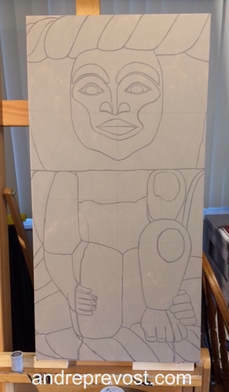 As I continue to work on the detailing on the large Brown Bear totem painting, the lower section of the Brown Bear story totem at Capilano Suspension Bridge, I've started inking in a canvas of the lower section of the House Pole at the Capilano's Visitor's Centre. I've always loved this section's colouring and textures. But unfortunately, I've yet to find the descriptions of all the stories and crests contained in this totem.